We live in the Pacific Northwest, arguably one of the loveliest areas of the United States. Tucked in a valley between the Cascades and the Coastal Range, we can be either at the coast or in the mountains in about an hour. Yes, it rains (a lot) in the winter and we miss the sun. But it's beautiful here, and we love getting out and exploring, hiking, and playing in our Northwest wonderland. This valley is also the Grass Seed Capital of the World, and just north of us are several grass farms. There are about three weeks in the spring where pollen billows through the air, funneling south toward us, and we are routinely proclaimed "worst in the nation" for pollen allergens. A few members of my family are quite miserable during this season, and we're always glad to escape when we can. This year we spent ten days near Mount Hood, about an hour east of Portland. It was a relaxing and fun time for our family. One of my favorite things was the hikes we were able to do. The wildflowers were in full bloom, and it was fun to walk slowly through the woods, pausing often to admire their delicate loveliness and appreciate the newness of life springing happily from the ground. Walk with me? These tiny little flowers were in a marshy area near a lake we walked around on our last day. There was also a lot of camas growing in this area. I love the color variations on this one! Somehow I missed the trillium at lower elevations this year, as we haven't been out hiking in a while. I was happy to find a few varieties of white trillium near Mount Hood, plus pink and purple! Foxglove... so many beautiful stalks of foxglove in bloom! Unfurled Fern Fronds... you will get that if you've read The Incorrigible Children of Ashton Place. We've enjoyed the first five books in the series over the last several months and are looking forward to the last book coming out later this year. I think this is False Solomon's Seal. Correct me if I'm wrong! We watched this little beetle with delight as he climbed a spiny leaf. I have no idea what this one is. Wild Strawberries... in can almost taste their sharp sweetness in a few more weeks! I think this is Indian Paintbrush... not sure. We have a large Bleeding Heart in our front yard, so it was fun to see it in the wild! There were so many tiny things springing forth from the earth, little things that I would have missed if I were more focused on the destination. More Unfurled Fern Fronds. Come on... say it three times fast! Purple Trillium. I normally only see the white where we are, so it was exciting to spot different colors! And lastly, Rhododendron, which grow abundantly in the forests here. A walk in the forest, for me, is such a beautiful and restorative experience. I love to be surrounded by the sights and sounds of wild things. Springtime walks among the wildflowers, far from the clouds of pollen, were a beautiful gifts I enjoyed this year, and I'm so thankful for these little bursts of beauty and color. I hope you enjoyed them as well! It's been there for years, this wooden box nailed to our fence. It's long sat empty, waiting for a pair of birds to claim it as their own. Made by little hands, nailed and fastened together, it's been full of nothing but hope as seasons have come and gone. But early this spring, as rains continued to fall from cold, grey Oregon skies, little voices excitedly proclaimed that they'd seen birds flying in and out of that box. For the last six weeks, we've watched with delight as this little mama and papa sparrow have day after day flown in and out carrying bits of this and that. We've laughed as one approached the nesting box carrying a twig far too big to fit through the little hole, watched with amusement as Papa Sparrow sat for a moment on top before reluctantly releasing his prize twig and fluttering off in search of something not quite so grand. The kids have been thrilled to see them picking up tufts of fur from our bunnies or bits of horsehair that have migrated home from the ranch. And then one day an egg was spied by a pair of peeking eyes. Some helpful child took a roll of packing tape and fastened the box so no one else would be tempted to open it and disturb this little family in the making. We watched with great anticipation as this faithful Mama and Papa took turns sitting on their clutch of eggs, flying back and forth all day long. And finally, about a week ago, we heard the first faint cheeping sounds coming from the box, and we've listened happily as the nearly constant cries have grown stronger. It's been a hard season for our family, a walking through trials that threaten to swallow us up. My faith has been stretched and tried and stretched some more. At times I am tempted to give up, but like Peter I say, "To whom would I go?" My mind often falls into the familiar groove of worry, my stomach knotting with anxiety and fear. How many times I have stood at my kitchen window and watched these little birds! And the gentle voice of my Jesus comes, bidding me to cast my cares on Him, reminding me to look at the birds of the air. Is it any coincidence that this year, of all years, this little pair of sparrows made their home not six feet from my kitchen sink? They are a gift, a reminder to my weary soul that if our Father cares for these little birds, how much more does He care for me and mine? Like Elijah's ravens, I believe they were sent to minister to my soul, to nourish and sustain my faith in a time when I've been tempted to despair. I have listened intently over the last week, hearing the persistent cheeping of tiny birds we've not yet seen. Their voices have changed swiftly from faint little chirps to loud and confident cries. Their Mama and Papa are continually flying back and forth to keep their brood fed. And I am reminded, again and again, that I cannot add anything to my life by being anxious. What I can do is join my voice to the chorus that is taking place outside my window, waiting confidently, trusting that I and my family are of much more worth than those little sparrows. If our Father cares for them, then how much more will He care for us and hold us close? If these little birds hunger and are sustained, then how much more will we, who hunger and thirst for righteousness, be filled? Soon that box will be empty again, and yet for me, it will still hold the reminder of the gift that has dwelt in it through this difficult season. I don't recall when I first became "acquainted" with Tsh Oxenreider, but I remember going through her book Organized Simplicity years ago and loving what she wrote about crafting a statement that defines who you are as a family. That helped me as I sorted, organized, and pared down in preparation for selling our home and traveling in 2012. I've since enjoyed her blog, podcast, and other book, Notes From a Blue Bike. Her love of travel, simplicity, and faith have often left me feeling like she's a kindred spirit, and more than once I've felt like she's written words that are in my heart. Chichen Itza, Mexico, 2007. There's a baby Raphael tucked inside. Little did I know at the time, but Tsh and her family lived just a few hours away from us before they too sold them home and embarked on nine months of world travel. Her newest book, At Home in the World, chronicles their journey as she and her husband Kyle, together with their three children embark on a round-the-world adventure. More than a travel memoir, it's one family's search for belonging and becoming, of seeking to discover the meaning of home and to reconcile one's wanderlust with the need to make a home in this world. Santa Barbara, California, 2012, our tiny home on wheels. I loved the freedom we had to explore with the security of having our own little home wherever we went. Like Tsh, I long to wander this earth, to explore the beauty that is so lavishly spread upon its seas and continents. I want to experience different cultures, languages, ways of life. I love to be in a place where the language is unfamiliar, where I'm half guessing at whatever I do. But at the same time, I and my family need the stability of a place to call home; we need to put down roots and sprout wings. I too live with the tension so well described in At Home in the World and struggle to reconcile my wanderlust with my love of keeping a home and filling it with memories and security. Morocco, 2017, having tea with a semi-nomadic Berber family. There are all kinds of homes in this world, and our lives were enriched by the generosity and kindness of this family who welcomed us into their humble cave. The Oxenreiders left home without knowing where they would land at the end of their journey. 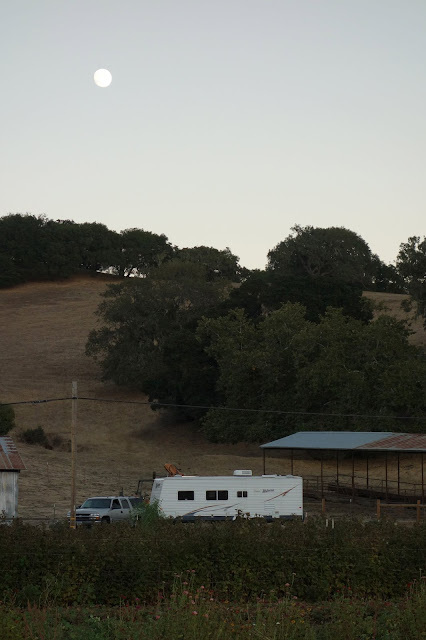 We did the same thing, having sold our home and pulled up stakes in Oregon, we set out into the unknown, trusting that when the time was right, we would know where to settle down. We assumed it would be in a different country, and were surprised to find ourselves back in our hometown a little over a year later, starting over in many ways. Although it wasn't what we had envisioned, it was definitely where we needed to be. Tsh and her family ended up in a familiar place as well, and for largely the same reason - community. Thailand, 2015. Pearl makes friends wherever we go. Our children need to grow up not only as part of a global family, but as an integrated part of our local community. We often connect with people while traveling, but for us, there is something to be said for the deep roots that we have put down at home. Being near family and friends who know and love us is something we can't replicate anywhere else in the world. We need to see the world and experience her beauty and culture, but at the end of the day (or the trip), it's good to have a place to call home. I have come to the same conclusion as Tsh, that in the end, we will always long for more, always have lingering feelings that maybe we should be somewhere else. As C.S. Lewis put it, "If we find ourselves with a desire that nothing in this world can satisfy, the most probable explantation is that we were made for another world." London, England, 2017. The Dr. Who fans among us were pretty excited to find the TARDIS! Having one of these would make travel so much easier! I loved reading about the Oxenreider's adventures as they traipsed around the world. It's always fun to meet other traveling families, and though we've never met them in real life, I feel like they're our kind of people, people crazy enough to take risks like selling their home and traveling with a family! Whether you are a jet-setter or armchair traveler, At Home in the World is both a fun and thought provoking read on what it means to find your place on this planet. Panama, 2013. We stayed overnight in a floating house on Lake Gatun, part of the Panama Canal waterway. Caimans and monkeys and parrots, oh my! I gasped in surprise and delight as we stepped from the bright desert sunlight of Morocco into the dim interior of the Tibetan monastery used in the film Kundun, about the Dalai Lama and his escape to India. It's a film I've seen several times, and the Tibetan people are dear to my heart after spending time amongst them in Nepal and in Mcleod Gang, India, current home of the Dalai Lama and the Tibetan Government in Exile. Before our trip I had learned of the presence of Atlas Film Studios in Morocco, and thought that if we were nearby it might be fun to visit. Peregrine has a keen interest in filmmaking, and when we learned that our trip to the desert would take us through Oaurzazette, we asked our guide if we could tour the studio. It was only about ten minutes away from where we stayed the first night, so the next morning we were excited to go check it out. Our tour guide was quite a character and had clearly given the tour a time or two (thousand). He was full of interesting bits of information and had quite a sense of humor. The books in the beautiful nooks of the monastery walls weren't books at all, but props made of something like dense foam. It was interesting to knock on "rock" walls, only to find them flimsy and hollow. The set designers are quite amazing! I look forward to watching this film again and spotting some of the places we saw. Our guide told us a cast of 300 Tibetans was on site filming over the course of a couple months. The Atlas mountains, not nearly as high as the Himalaya, served as a decent stand-in! The courtyard of the monastery. Pearlie and me in front of the gate into the monastery courtyard. Leaving Tibet, we stepped into a village that might be ancient Jerusalem. Movies such as The Passion of the Christ, Jesus of Nazareth, and The Last Temptation of Christ, and Gladiator, and Ben Hur have all been filmed here. It was interesting to see behind the scenes, as many of the sets are built to be filmed from only one side. Again, we were so impressed with the sets and how realistic they looked! I want to watch some of the movies filmed here now. Traveling back in time, we entered ancient Egypt! This was a massive hall full of pillars, the court of some Pharaoh or another. Moses, Jewel of the Nile, Cleopatra, and The Mummy have all been filmed here. Kids, we're not in Kansas anymore! This one reminded me a little of the Lincoln Memorial! We had such a fun time strolling through history and learning a little bit about filmmaking in the process. I'm so glad we took the time to visit Atlas Film Studios. Tizi n'Tichka is one of the highest paved passes in the High Atlas. The road leading to the pass was winding and narrow in places, but well maintained, and our driver was cautious and attentive. The lure of the Sahara was too great to pass up and we knew we had to make an excursion across the Atlas in order to experience a bit of the famous desert of Africa. Many tour operators offer guided trips to the desert, and we spent a bit of time in Imlil looking at different options. In the end, we took a recommendation from someone in our family travel group and booked a four day private tour through Desert Majesty. We've never done anything like this before, usually being content to piece together our own adventures using public transportation and sometimes renting our own vehicle. We were very happy with our experience and felt it was worth every penny to have our own personal guide and driver for the excursion. We definitely saw and experienced things we wouldn't have on our own. After a hearty (carb-filled) breakfast at the Riad Atlas Prestige, we loaded our bags onto a trusty mule and made our way one last time down the steep, rocky path into the village. There we met Said, who was to be our driver and guide for the next four days. Young and friendly, Said is from a Bedouin family and grew up as a nomad in the desert. At some point his family moved into town so his siblings could attend school; a few days into our excursion he took us to his family home where his lovely mother served us a delicious meal. But I'm getting ahead of things; first we have to get there. Our first day's journey took us down the valley from Imlil and back toward Marrakech. From there we headed up into the High Atlas and over the Tizi n'Tichka pass. We stopped for lunch at a funny place, clearly set up for tourists, the sort of place we would never eat on our own. The kids were thrilled to have french fries and omelettes, and Erik and I ordered tagines. We joked with Said how we didn't usually eat at places like this, and the next day he took us to the local place instead. Erik and I thought the food was much better, and the kids, well, the kids ate bread for lunch. Goat tagine just didn't appeal to them! We continued on our way and in the late afternoon took a little detour to stop and walk around the ksar (fortified village) of Ait-Ben-Haddou. 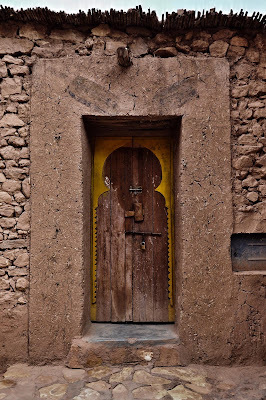 It is situated on the southern slopes of the High Atlas along the ancient caravan route that passed through the Sahara to modern day Marrakech. Built of earthen clay, it has been beautifully restored and maintained using traditional materials, primarily earth and wood. There are still a few families that live inside the ksar, but it is mostly empty now. It is preserved as a UNESCO World Heritage Site and dates back at least to the 17th century. I am always struck by how people who had to work so hard just to survive put in the effort to beautify their surroundings. It inspires me to continue to create beauty in my home, even when it seems that no one appreciates it. I do believe it makes a difference! I love the decorative motifs on the walls. The surrounding hillsides reminded me of the American Southwest with its deserts and painted hills. Up, up, up we walked, on ancient stone paths worn smooth by centuries of feet. At the very top there was an additional fortification and a large building that we were told served as a storage facility for food. Each family would contribute to the store, and it was kept for times of drought or siege. Looking out at the surrounding hillsides, I was amazed that people could bring life out of what appeared to be so barren. Across the river is the "new" town. You can see that Ait-Ben-Haddou is built above an oasis. Morocco is a beautiful country of contrasts, with snow capped mountains rising from the desert! It's quite likely that you've seen Ait-Ben-Haddou, as it's been the setting of quite a few movies. Morocco has a thriving movie industry, and the next day we visited one of the big movie studios in nearby Oaurzazette. This ksar, being so well preserved and complete, looks like something straight out of the Bible, and has been used as a film set in such movies as The Last Temptation of Christ, Jesus of Nazareth, The Jewel of the Nile, Gladiator, and more recently, some episodes of Game of Thrones. It's easy to see why this is a favorite location for such movies! This must be the "yard" of one of few inhabited homes remaining in Ait-Ben-Haddou. Many Berber families still live in close proximity with their animals. 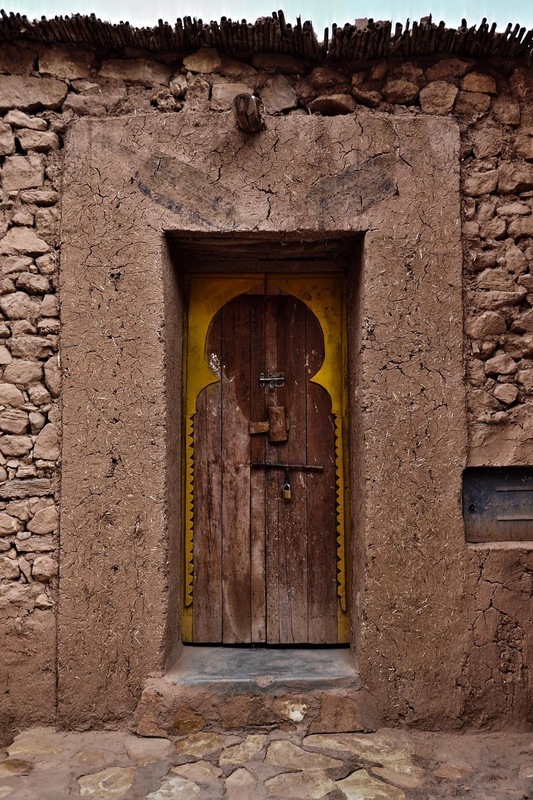 Erik could walk around all day photographing the beautiful doors of Morocco. One final glimpse of Ait-Ben-Haddou as we crossed back over the bridge to the new village to continue on our journey. I'm so grateful to have seen this place. Many Moroccan villages still blend into their surroundings like this, with walls that match the reddish earth. As we walked back to our car I was struck by the light on the blossoming trees, their delicate fragrance filling the late afternoon air. The center of our riad in Oaurzazette. The picture doesn't do justice to the grand scale of the archway. Five course meal? Yes, this is the way we travel when Desert Majesty books our accommodations! Upon our arrival in Oaurzazette, we stopped in at the Desert Majesty office to pay for our excursion and get a briefing on what to expect. We were met with a warm welcome, mint tea, and cookies. The office was right on the city square, and as it was Friday, the Muslim holiday, many families were out enjoying the evening. The smell of popcorn hung in the air, and children raced around the square on little battery operated cars and trucks. The city seemed clean and modern and friendly. The view from our riad in Oaurzazette, looking out over the date palm oasis to the snowy Atlas beyond. Have I mentioned that Morocco is beautiful? From the Desert Majesty office we drove just a little further through Oaurzazette to the riad where we would stay that night. Our package included accommodation and meals, and we really didn't know what to expect. We pulled into a little courtyard and Said began unloading our luggage. Ripe oranges hung heavy on the limbs of a nearby tree. We walked into a beautiful hotel built in riad style, around an open courtyard. We were given two rooms, so Erik and I each took two kids for the night. We'd left Imlil with slightly damp laundry, so before long my room had clothing hanging and laying out to dry on every available surface! We made our way to the dining room and were surprised to be served a five course meal on white linens. This is definitely not our normal choice of accommodation, but we enjoyed it. The goats bleating outside the window through the night, accompanied by the occasional dog and rooster, reminded us that we were indeed still in Morocco.